Najeeba Syeed-Miller, Assistant Professor of Interreligious Education, announces the launch of a project at the Claremont School of Theology that will integrate the education of ministers, rabbis and Muslim religious leaders. When Jerry Campbell became president of California's renowned Claremont School of Theology four years ago, low enrollment and in-the-red books threatened to close the 125-year-old institution. But since Claremont is the only United Methodist seminary west of Denver, Campbell resolved to find a way to stay open. Drawing from classic American entrepreneurial wisdom  when faced with extinction, innovate  and a commitment to engage today's multi-faith culture, this fall Claremont will commence a first on U.S. soil: a "theological university" to train future pastors, imams, and rabbis under one roof. The experiment to end isolated clerical training brings together Claremont, the Islamic Center of Southern California (ICSC) and the Academy for Jewish Religion California. The hope of officials at all three organizations is that when leaders study their own religious traditions together alongside friends of other faiths, they will develop the respect and wisdom necessary to transform America's fractured religious outlook. The project hatched naturally from Claremont's desire to engage southern California's religiously diverse population. "We're trying to catch up with the practical reality of how congregations, synagogues, and mosques are already trying to create some rapport among themselves," says Campbell. 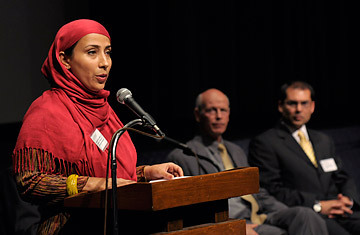 Not only will the project offer comprehensive multi-faith classes, but also it hopes to establish the first accredited imam-training institution in the U.S.
Only recently has the American Muslim population had the finances and the student pipeline to try to launch its own higher education institution; today's imams have trained either overseas or in community-based but unaccredited mosque programs. In addition to Claremont's efforts, Connecticut's Hartford Seminary is seeking accreditation for a new imam-training program, and Zaytuna College, a new, unaccredited Islamic liberal arts school in Berkeley, Calif., hopes to eventually include clerical classes. The Claremont project, which so far has helped the school boost enrollment for this coming year by nearly 10% compared to last year, is part of a broader trend in American theological education as schools face an increasingly pluralist society. While none go as far as Claremont will to broadly train non-Christian clerics, other big-name Protestant programs have added world religion classes as well as partnerships with Jewish and Muslim programs. Hartford Seminary is known for its specialty in Christian-Muslim studies, and Harvard Divinity School requires in-depth study of at least two religious traditions. The Association of Theological Schools (ATS) begins formal discussions this fall to explore how pluralism might change pastoral education. "I think that we are on the cusp of a lot of change, but we are at the front end of it, so it's not clear which of these are going to be the survivors, what new models might in fact emerge," says Daniel Aleshire, executive director of ATS. "In 20 years, the whole theological training landscape could be quite different." Already two other theological schools  Boston's Andover Newton and Chicago's Meadville Lombard  have followed Claremont's lead and in June announced plans to form similar interfaith consortiums. Claremont's greatest contributions, however, may extend beyond the Christian community. An American imam-training program has long been "a dream" for Muslims, says Imam Mohamed Magid, vice president of the Islamic Society of North America. Not only has the supply chain for imams in the U.S. suffered since 9/11 largely due to immigration and visa issues, but also he points out, "In order for second-generation Muslims to have Islam be relevant to their life, they have to have an imam who understands American culture." The partnership with Claremont will allow the ICSC to realize its 20-year vision for an Academy of Islamic Thought, a program that can now become the new imam-training school. To be sure, Claremont's push to desegregate religious education has encountered its share of roadblocks. The most notable to date occurred in January when questions about Claremont's commitment to Christian education nearly cost the school its funding and sanction from the United Methodist Church. After a five-month investigation, Campbell prevailed. "We explained clearly to the [Methodist] review team that in fact our United Methodist character continues intact throughout this program," he said. "We intend to be the Christian partner in this endeavor, and so we are not changing our United Methodist character essentially in any way." Additional hurdles lie ahead. The Claremont project has to gain an endorsement for the new Islamic Center from Egypt's famed Al-Azhar University, the world's leading Sunni institution whose word gives weight to Muslim programs worldwide. And because Claremont still needs to find Buddhist and Hindu partners, hire up to 25 new professors, and raise an additional $104 million to pay for endowed faculty chairs and facility expansion, Campbell estimated that it will be nearly 10 years before the multi-faith project is in full swing. In the meantime, the outlook for this interfaith model appears positive if cautious. When the project was announced, a group of more conservative Claremont students considered leaving, but no Claremont professor has resigned and only one Academy for Jewish Religion faculty has taken a leave of absence in response to the new joint initiative. Claremont Christian History Professor Esther Chung-Kim acknowledges that from a historian's perspective, Claremont is going out on a limb. But, as she says, "If we don't try it, who will?" Long-term enrollment will determine the venture's sustainability. "I'm willing to push ahead and see what happens," Chung-Kim says. It will be up to America now to prove Claremont's hypothesis. See 10 surprising facts about the world's oldest Bible.